you to upload video from your phone to YouTube directly. thumbnail and related descriptive information. ideal in terms of providing a consistent experience across the phone. also get the best performance in areas with 3G coverage. 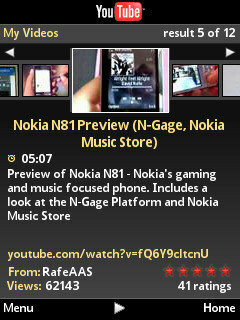 Here you can see the Home Screen and the pop up menu for Popular videos followed by the video list screen. Shown above is the video playback screen which mimics the website look and feel. screens / functions including the My Account screen shown in the third screenshot. 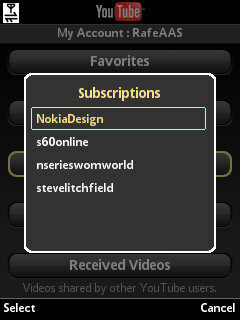 In the My Account area you can can access your subscriptions, and view your own videos. The last screenshot shows a video being selected for upload. quality if you use one of the third party YouTube clients such as emTube.